The Vanuatu chapter of Transparency International issued a press release on July 29 on Vanuatu's recognition of Abkhazia. The press release does not represent the opinions of Transparency International Georgia and is only a re-posting of the press release. We post this to highlight the work of our colleagues in Vanuatu and we believe it is of interest for the Georgian public to get access to the press release. In case of any questions for Transparency Vanuatu, please contact Francis Bryard, Project Coordinator, at transparency@vanuatu.com.vu. What is really behind Vanuatu’s recognition of Abkhazia? Three months ago, how many people in Vanuatu had heard about the existence of the Black Sea region of Abkhazia or even of the recently independent nation (former Russian territory) of Georgia? How many people were aware that Abkhazia has been accused of ethnic cleansing on a massive scale, displacing with Russian assistance between 200 – 240,000 ethnic Georgians (equivalent to the entire Vanuatu population) from this territory? Then suddenly, these two countries made the front pages of our local newspapers. So what was all the fuss about? Those people in Vanuatu with a good knowledge of our history would have noted the historical errors in the Goiset statement. While it is true that Nagriamel has played a part in the struggle for Independence, its President was not a signatory to the Constitution and the Movement has not been recognized by the UN as a customary movement as this did not exist at the time. Moreover, somepeople wouldbelieve that the Nagriamel movement was the leading movement in Santo’s rebellion and in fact opposed the newindependent nation of Vanuatu. We, the Government and the People of the Republic of Vanuatu are deeply saddened by the sudden passing of the President of Abkhazia H.E. Sergei Bagapsh. We would like to express, to the people of Abkhazia our most sincere condolences. The People and the Government officials of the Republic of Vanuatu wish to convey sincere condolences to the close family of late President; Mr. Bagapsh was a truly inspiring leader, availing opportunities and independence in the interest of the People. We wish to convey our assurances to the Government of Abkhazia that the foundations laid by the late President in establishing political and economic relations between our respective countries shall continue to prosper, in the interests of our peoples. With deepest respect and since condolences. 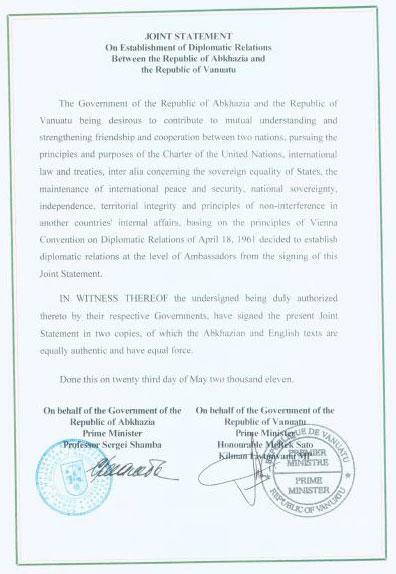 This was the first official sign that Vanuatu was establishing diplomatic relations with Abkhazia. On the 15th June, Abkhazia was again on the front page of the Daily Post when another confusing article explained that John Singh, the senior political advisor to PM Kilman, says that Vanuatu has not established any diplomatic relations with Abkhazia yet but it was only an intention. This was a clear contradiction of the 23rdMay 2011 documents signed by both Prime Ministers. On the 17th June, the Vanuatu Supreme Court declared Edward Natapei as Acting Prime Minister after a protracted constitutional legal battle between Natapei and Kilman. PM Kilman was removed from Office. The next day, Edward Natapei, in a quick and unexpected move, considering Vanuatu’s heavy political agenda, withdrew the recognition of Abkhazia, mainly because the majority of the UN members did not recognize Abkhazia as a country, and instructed Vanuatu’s Ambassador to the UN to commence relations with Georgia. A few days later, the Center for Justice, an advocacy group promoting the rights of the internally displaced persons in Georgia, appealed to the President of the Republic and to Vanuatu’s Prime Minister to reconsider Vanuatu’s position and urge Vanuatu not to recognize a government that is accused of ethnic cleansing, and to adhere to the international law and fundamental principles of humanity. 10 days later, and after another constitutional case, the Supreme Court declared Serge Vohor’s election unconstitutional and Prime Minister Sato Kilman and Foreign Affairs Minister Alfred Carlot took back their portfolios. At the beginning of July, the Vanuatu government announced that Vanuatu’s UN Ambassador I New York, Donald Kalpokas, would be recalled. This was not a surprise and it seems that the real reason behind the decision is the international fiasco with Abkhazia. In the same issue, the Vanuatu Times revealed that the proper procedure had not been followed and that no proper assessment has been conducted by the Department of Foreign Affairs, which is normally a compulsory requirement in such matters. That same week, the government asked the Department of Foreign Affairs to formalize the diplomatic relations with Abkhazia and issue a recruitment notice for a Vanuatu Roving Ambassador to Russia. What can be concluded about this seemingly bizarre sequence of events- and what precisely is the status of Abkhazia? Personal conflicts and interests can play a major role and distract any rules, any regulation or any procedures in place and ridicule our small country when it comes into international relations and diplomacy. Alfred Carlot was previously Vanuatu’s Ambassador at the UN. He was recalled by the then Vanua’aku Paty led-government, a political party Donald Kalpokas belongs to and once headed as Prime Minister. WereMinister Alfred Carlot’s actions in announcing the recall of Donald Kalpokas, especially the way in which he seemingly unnecessarily denigrated Kalpokas in the media, motivated by some form of petty vengeance? It would be very troubling if this were the case, since this drama is being played out on the international stage, not in some private back room. Mrs Goiset claims to speak for the Nagriamel movement, but her assertion is rejected by the President of Nagriamel, who says her role in this whole affair is her own personal responsibility. While all of this might appear from the outside to be a game of petty politics and personal ambition, it has now had a negative effect on our diplomatic relations generally and on our country’s reputation specifically. Of all of this, Vanuatu has not gained more respect on the international scene. On a more global approach, the Vanuatu government seems to have confused struggle for independence with secessionist movements. While Vanuatu has in the past taken a strong position in support of independence movements in for example New-Caledonia and West-Papua, this was done according to international laws and based on a perceived shared destiny and what is sometimes called Melanesian brotherhood. The New-Caledonia’s independence movement is for example an issue duly recorded with the United Nations Decolonization Committee. The case of Abkhazia and this Government’s diplomatic recognition of it would appear to have nothing in common with these movements. Abkhazia is a break away region of Georgia, a country born in the 1990s after the break up of the Soviet Union. Since the 1990s, the Russian Federation has tried to keep its influence in this region and has encouraged the secession of Abkhazia and South-Ossetia. On the 9th April 1991, Georgia declared its independence from Russia. On 21st February 1992, Georgia's ruling Military Council announced that it was abolishing the Soviet-era constitution and restoring the 1921 Constitution of the Democratic Republic of Georgia. Many Abkhaz interpreted this as an abolition of their autonomous status, although the 1921 constitution contained a provision for the region's autonomy. On 23 July 1992, the Abkhaz faction declared effective independence from Georgia, although the secession was boycotted by ethnic Georgian deputies and the gesture went unrecognized by any other country. The Abkhaz leadership launched a campaign of ousting Georgian officials from their offices, a process that was accompanied by violence. This was followed by a war between Georgia and Abkhazia that resulted in the victory of Abkhazia in 1993. During that war, gross human rights violations were reported on both sides, particularly in Abkhazia where as stated above between 200,000 and 240,000 Georgians were deported. In 2008, war resumed and escalated to a full blown conflict between Russia (who support Abkhazia) and Georgia. This resulted in another victory for Abkhazia-Russia in August 2008. Since then, the Russian army is de-facto occupying Abkhazia, a situation said to be necessary in order for Russia to keep the peace. What appears certain is that Russia is the main political and military player and that in the realm of realpolitik Abkhazia has little choice but to align itself with Russia’s wishes. This region and Abkhazia’s situation is complex and sensitive, and of all the countries or parts of the world that our small Pacific Island nation could be looking to build diplomatic relations with, it must be asked – why the region of Abkhazia?, a territory that is apparently recognized by fewer than a handful of countries. Vanuatu has in the past been embarrassed by widely publicized diplomatic blunders such as when Vanuatu recognized Taiwan in 2004 only to switch back to recognizing China a month later, when the prime minister at the time Serge Vohor, who made the deal, was forced from office. The recent Auditor General’s draft report into the Beijing Embassy brought further disrepute and embarrassment to Vanuatu. It is hardly surprising that Russia has come out in support of Vanuatu establishing diplomatic relations with Abkhazia, given Russia’s support of Abkhazia against Georgia. A country’s diplomatic representatives or aspiring ambassadors should be individuals of good standing. They should bring credit to the country. They should not be having financial difficulties that may prompt them to behave corruptly. Ideally they should have a proven record of verifiable service to the community either through public service, politics or career diplomacy. If we continue to nominate or appoint diplomatic representatives on the narrow one dimensional basis of political loyalty which so often leads to expedient and self serving actions. It is one thing to be politically naïve about events the wider world, but locally, if there have been any breaches of the Leadership Code, any undue influence, or any other form of official misconduct, then it should be investigated. Perhaps also, before Vanuatu takes any tangible measures to establish diplomatic relations with any country or part of the world, an open and transparent process should be introduced allowing public comment from qualified or informed persons, which may also help avoid politically embarrassing decisions like this recent debacle with Abkhazia, which has diminished the reputations of everyone involved.